Saboteurs brought a weekend of disruption to Iraq following attacks on a key oil pipeline in the north of the country and a water pipe in central Baghdad. Fire engulfed a section of the newly-reopened pipeline from Kirkuk, forcing it to close again for repairs that officials warn could take weeks. Meanwhile, around 300,000 people in Baghdad were deprived of water after an attack breached an important water pipeline, flooding many streets in the city. US governor of Iraq, Paul Bremer, has warned that continuing sabotage attacks on Iraq's infrastructure will hit the country's economic recovery. 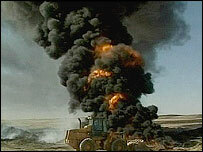 Mr Bremer said the attack on the oil pipeline would cost Iraq $7m a day and "hurt the process of reconstruction". "The irony is that Iraq is a rich country that is temporarily poor," he told the meeting of a committee coordinating foreign aid for Iraq. The damaged pipeline carries oil from the giant oilfields at Kirkuk, which produces 40% of Iraq's oil production, to a Turkish terminal at Ceyhan. It had only just opened on Wednesday for the first time since the invasion of Iraq in March, when the fire broke out on Friday at a section in Baiji, north of Tikrit - hometown of ousted President Saddam Hussein. "We believe at this stage it was an explosive device planted on the pipeline," said the US-appointed interim oil minister in Iraq, Thamir Ghadban, following the blast. There were reports of a second blast on Sunday on the same oil pipeline, which officials were quoted as saying was also sabotage. Oil exports are key to US plans for reconstructing Iraq, and engineers have worked for months to get pipelines - crumbling after more than a decade of UN economic sanctions - up and running again. A US army spokeswoman said: "The North Oil Company is on site to make repairs, which are estimated to take at least two weeks to one month." Mr Ghadban admitted there was a problem with security in Iraq, although he stopped short of criticising the US-led administration. "In the past regime, we had the oil police, the army and the co-operation of the tribes, as well as what we call internal security," he said in remarks quoted by AFP news agency. "Now all this has disappeared. There is a void in security." 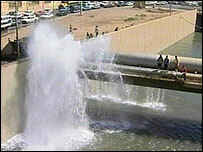 In Baghdad, engineers warned it would take eight hours to repair the breached water pipeline that flooded main roads in the city. The International Red Cross said some 300,000 residents were without water and warned of people's increasing impatience with the lack of reliable basic services. Officials say the water pipeline was sabotaged, and local residents reported hearing an explosion in the morning and a car driving away from the area at speed. "The bad news for this country just keeps on coming"